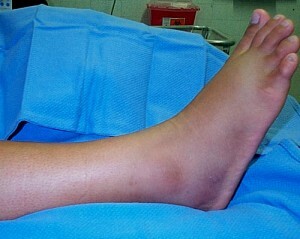 One of the most common bone injuries includes ankle fractures. The severity of the fracture to seek medical care can be determined by the degree of pain and discomfort while walking, your inability to walk or if you suspect that a bone might be broken. The details posted on this blog are for information purposes only. Learn to recognize, manage and help victims with broken bones and fractures by enrolling in St Mark James first aid and CPR training. To learn more about bone, joint and ligament injuries and how to provide first aid for them enrol in St Mark James first aid and CPR training (more information).